Plug-in hybrid technology is the bridge to a future of electric drive vehicles that we’re only just beginning to realize. While few wade into the pure electric field, many are providing offerings in the PHEV field, including Ford, by offering the Fusion Energi as a hybrid version of their latest Fusion sedan. The Fusion Energi offers an ideal alternative to pure electric drive, allowing near zero emission city driving, with a combustion engine allowing for extended range driving – negating the fear of range anxiety that plagues the electric car revolution. The Fusion is a mix of both good and bad ergonomic elements. Easy entry to the front seats is offset by a sloping roofline and difficult entry to the rear of the cabin. That sloping roof also impedes head room in the rear, though leg and shoulder room are ample and on par for the segment. For the price of the Energi, you don’t see much of an improvement in cabin material quality – making it feel cheap, though only for its price. The additional cost has been invested in the electric system, though the packaging of it is sub-standard and has negative effects on storage capacity. The battery pack is mounted in the trunk floor, but leaves the trunk awkwardly shaped. Though the cargo capacity is rated at 8.2 cubic feet – nearly half that of the standard model – the odd packaging means that diminutive figure isn’t entirely usable. With an additional 500+ pounds over standard Fusion models, the Energi’s extra weight doesn’t bode well for handling dynamics. The extra weight overpowers the front-wheel drivetrain and tires on the 18-inch alloy wheels, resulting in lower grip levels than standard for this segment, and a tendency to understeer. The additional weight has been offset by suspension with more spring to it. It supports the weight decently well, but over bumpy roads the ride develops a bouncy quality and porpoising motion. But the dampers have been tuned brilliantly to deal with the extra weight, ironing out broken tarmac for a smooth secondary ride. The steering is pleasantly weighted with ample responses, though the same can’t be said of the brake pedal that has a mushy initial feel. The overall comfort levels are impressive though, but the changeover between electric and combustion drivetrains creates jerky body motions that are unpleasant. The Ford Fusion derives its combustion power from a 2.0-liter inline-4 with 141 horsepower and 129 lb-ft of torque. A 7.6kWh lithium-ion battery pack supplements power outputs through a 118hp electric motor for combined total outputs of 188hp (195hp is available for brief periods), sent to the front wheels through a continuously variable transmission. A 21 mile electric range is available, though with poor performance, and a full charge takes 7 hours on a 110-volt system (2.5 hours with 240V). The EPA rates the Fusion Energi as having a 43/41 MPG equivalent for city and highway driving respectively. Most hybrid vehicles have just one trim – the Fusion Energi has 3, SE Luxury, Titanium, and Platinum. The specification level is high, even in SE Luxury trim, with heated leather seats, dual-zone climate, and Ford’s Sync 3 infotainment system, but Titanium trim adds ambient lighting, front sports seats, and power front passenger seat. The top Platinum trim features upgraded leather upholstery and a power steering wheel, plus a sunroof and navigation. Available safety features include blind spot monitoring, rear cross traffic alert, and lane departure warning as part of a Driver Assist package. 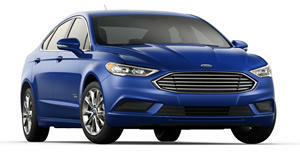 The Fusion Energi scored 5 out of 5 stars from the NHTSA. All electric mode offers neutered performance, and the range is bettered by some rivals. But the nail in the coffin for the Fusion Energi is two-fold – the price is exorbitant, and the battery pack severely compromises utility. It’s difficult to recommend the Energi when buyers in this segment truly value usable cargo space.